But, here we are with simple steps to remove these scratches if they happen. You may need a lot of patience and a couple of more things like Sand paper, wax, polyurethane or shellac, etc. Getting step wise, The first method needs fine sandpaper and loads of patience. The sanding itself isn’t a big job; you simply rub with care over the length of the scratch, moving in line with the wood grain. The time-consuming part is that you need to re-varnish, paint, or wax the area to get back to a uniform colour, which is where your patience will come in. Typically during manufacture, varnish, polyurethane, or shellac is applied to wood to protect the surface. Applying wax or polish protects the manufacturer’s finish and helps to reduce surface scratches. Wax provides a hard finish and long-lasting protection, doesn’t smear, and is more durable than sprays or polishes. Use paste wax or liquid wax made specifically for furniture. Depending on use, paste wax finishes may last as long as two years. Liquid wax is easier to apply but leaves a thinner coating; it may need to be applied more frequently than paste wax. Learn how to properly apply waxes to eliminate streaks or a cloudy appearance. 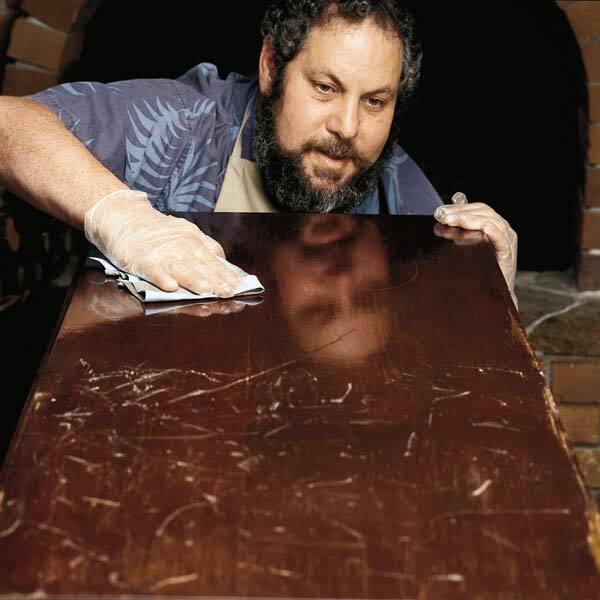 Always apply wax in light coats, rubbing into the surface with the grain. Allow to dry and buff to a clear shine with a soft cloth. · Put a spoonful of wax, about the size of a golf ball, in a square of 100-percent-cotton fabric. Wrap the fabric around the wax ball and knead it until soft. · Rub in a circular motion, one small area at a time, until the waxing is complete. · When the surface dulls, wipe off the excess wax. Use a clean, soft cotton cloth and turn it frequently. · Repeat waxing and wiping until the entire piece is waxed. If you notice a streak, keep wiping to remove excess wax. · Polish the wood, with a soft cloth or lamb’s-wool pad attached to an electric drill or power buffer. If the wax smears, wipe with a soft cloth and continue buffing. · For a deep shine, apply a second coat of wax in the same manner; to maintain waxed furniture, dust with a lamb’s-wool duster. Never use liquid or aerosol furniture polishes because they can dissolve the wax and leave a hazy film. So, for everyday wood and wood-effect furniture, you may want to take a short cut and simply cover up the scratch. Ideally, use wood stain or a coloured polish that matches your furniture. Apply the solution to a soft cloth, and then work it into the wood. If you can’t get a colour match, use a wax crayon. Most children’s ranges have a tremendous variety of browns – and these duller shades always kick about in pencil cases after the snazzy reds have long gone. To fix scratches in leather, again use wax crayons. This is effective for both bags and shoes, and can work as a last resort for coats. Polish afterwards with a soft cloth to remove loose wax. Scratches in plastic are less easy. It is worth trying a light oil such as WD-40 on white appliance scratches, such as fridges and washing machines. However, on white plastics that have a natural matte finish, doing nothing brings a solution of some sort. Scratching shows up most obviously on surfaces that are highly polished. As your items ages, scratches blend in.Repaint over scratches in paint. Simply paint over the scratch and then, just before the paint has dried, take a damp cloth and blend the edges of the new paint in with the original paint to avoid any tell-tale lines. This entry was posted in Hardwood Furniture and tagged Furniture, Furniture Store, Hardwood, Pune, Rosewood, Scratching, Sheesham, Teakwood, Wood, Wooden, Wooden Furniture. Bookmark the permalink. ← Festive Seasons perfect reason to blend in with the trends!